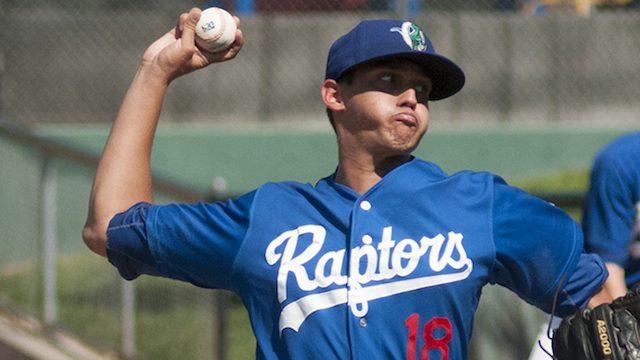 The Pioneer League announced Saturday that former Raptors pitcher Jose De Leon was named the league's Pitcher of the Year. De Leon led the league with 77 strikeouts. His 2.85 ERA and 1.16 WHIP also would lead the circuit had he enough innings under his belt to qualify. De Leon was named the league's Pitcher of the Week twice. For the week of Aug. 4-10, he pitched seven shutout innings and allowed just three hits and no walks with 11 strikeouts against Helena. He also won for the week of June 23-29. In two starts against Orem, De Leon went 1-0 with a 2.77 ERA. He struck out 18 batters, including 12 in seven innings on June 23 in a win. De Leon was also named to the Pioneer League All-Star Team. The Raptors only other All-Star was catcher Julian Leon. Through Saturday, Leon was fifth in the Pioneer League in RBI (49) and fourth in slugging percentage (.550). Leon was hitting .316 with 14 doubles and 11 home runs. The Raptors had three players named as honorable mentions. Outfielders Devan Ahart and Jacob Scavuzzo and first baseman Justin Chigbogu were named as honorable mentions.